Too be honest the models are all over the place with this so no point worrying at the moment. I would take a look at the Models Sunday to find out whether you'll need a sick bucket or not. I had a flight back from Belfast booked on the day of Ophelia last year. Was so relieved when the flight got cancelled. Travelled back the next day nice and smoothly. The way I see it is when you're paying someone to move you from A to B, why should you travel in discomfort? I'd rather have experienced severe weather with ridiculous turbulence!! I get bad travel sickness...mixed with anxiety, not a great recipe! Tropical Storm Helene is the system which is pertinent to us here in Ireland because current guidance indicates that Helene will take a northeastward track towards our shores early next week. Tropical Storm Helene is already transitioning to an extra-tropical cyclone southwest of the Azores Islands. This means that Helene will lose it’s tropical characteristics including it’s warm core, organised deep convection and closed surface wind circulation and become more akin to the low pressure systems we are used to seeing in our part of the world. It will develop fronts, the strongest winds will shift around to the east and south of the low pressure system with the heaviest rain on the western side of the low pressure centre. The current forecast is that “Storm Helene” or “ex-Tropical Storm Helene” will be to the south of Ireland on Monday night. Current guidance has the low pressure system moving northeastwards up through the Irish Sea overnight Monday and early on Tuesday, although the exact path is still uncertain. A humid spell of wet and windy weather is expected to sweep up over Ireland on Monday night and early Tuesday as a result. Current guidance suggests the potential for warning level winds and perhaps rain with the system. There remains some uncertainty in the track of the system. 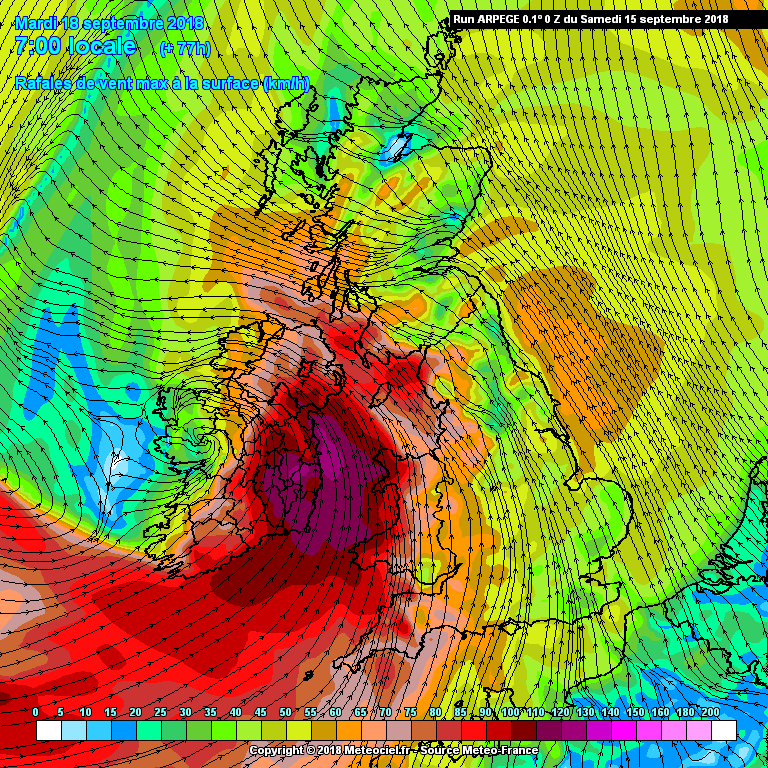 Met Éireann forecasters will continue to monitor the situation and issue warnings, as required, closer to the time. Not looking like there is much to be concerned about at the moment. That could of course still change, still time. ukmo fax charts are a load of nonsense this morning Helena disappears in the 12 hrs after retreating backwards. It looks like the track will be either up through Ireland or just of the coast of Ireland. For most of the uk nothing to worry about Irland and areas bordering the Irish see and later northern England and southern Scotland should see some high winds which will pass through fairly quickly. Irland and Scotland will see plenty of rain but dry and humid elsewhere. NW wales will get the strongest winds. These are at sea level or 10m height. At my elevation and exposed as we are, I imagine gusts could exceed 75mph. Anglesey could be the worst affected area in Wales but Ireland is even more at risk because the storm could track further west than predicted. I intend to tether a couple of small trees I have, because I have lost young trees in similar conditions before. southeastern quadrant were revised based on a partial ASCAT pass. Helene has turned northeastward with the initial motion now 035/18. and the United Kingdom late this weekend and early next week. official forecast track since the last advisory. during the next several hours and continue through tonight. It is included more of Northern England now. Looking generally weaker overall and slightly further eastward the rainfall Northern Ireland and later Scotland maybe the most notable feature of this former hurricane and the overnight warmth for the rest of the UK. GFS maybe under doing the day time temperatures. discussion on Helene should surely go into the MOD now? possibly, however, there is always a separate discussion wrt UK cold spells which inevitably ends up with some model related discussion included, I think the mods are more bothered about non-model related discussion in the MOD thread than model discussion in more general threads TBH. Actually noticed that she has her own thread in the Atlantic storm section so I expect this thread to become dormant. HA - sorry!, I actually mistakenly thought that that was the thread I was replying to!